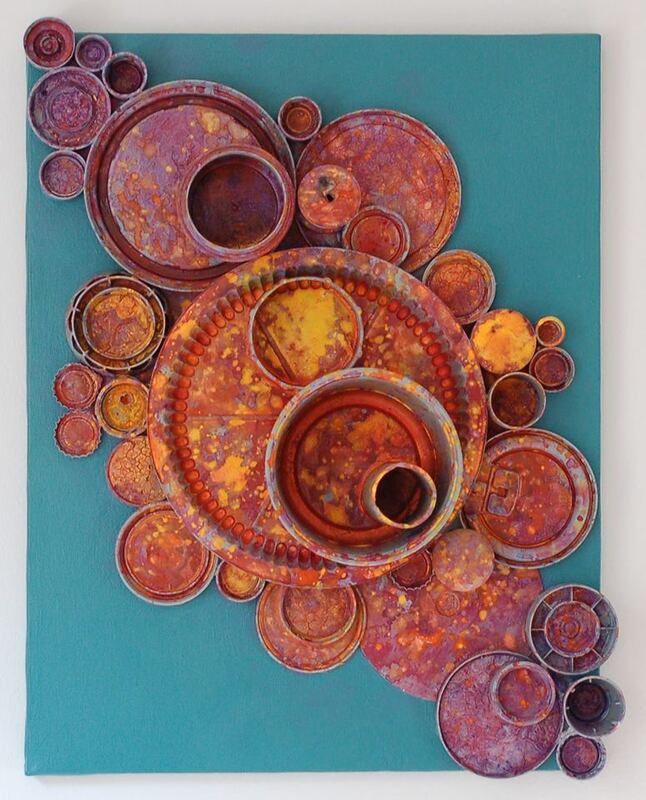 In Re:circled, Washington DC visual artist Sarah E. Dale presents an elegant, circle-centric series featuring lids from her recycling bin, rehydrated paint and materials found on the street. In this solo exhibition in the Green Gallery at The Scrap Exchange, Dale uses the shape of a circle to sharpen focus on society’s discards while also addressing the circular nature of human life. If our lives are three-dimensional, overlapping things, should they not be splashed with vibrant colors? As part of her exhibition, the artist would like to give away one piece from her show to a randomly selected person who mentions the artist (@sarahedale) and The Scrap Exchange (@scrapexchange) with the hashtag #recircled on Twitter or Facebook at any point during the exhibit. This program was made possible by gifts to the Durham Arts Council’s Annual Arts Fund, and support from the North Carolina Arts Council with funding from the state of North Carolina and the National Endowment for the Arts, which believes that a great nation deserves great art.